In this debut memoir, a psychologist shares the wisdom she received by opening her mind. Sanderson is no stranger to the concepts of self-awareness and spirituality. As a psychologist who helps others cope during crisis situations and discover meaning in the most intense human experiences, she deftly writes about the mind’s often complex routes to finding inner fulfillment, peace, and enlightenment. This work is unusual in the way that it honestly shares a woman’s path to becoming a “medium” of sorts, tapping into the messages being distributed by energy sources around her. The author is open from the beginning about the shocking and uncomfortable nature of this transition, and invites readers to travel from the practical and research-based realm to the nonmaterial world of energy exchange. Sanderson repeatedly refers to “PoE,” which means “point of existence.” This idea involves using the heart to perceive events rather than simply employing the senses. For example, in a discussion of music, the author writes: “If humans would allow the music to flow through the heart centers, there would be a shift to a state of expanded awareness, which would allow for a fuller, richer experience than what the sense of hearing allows. The music carries the listener to a realm of expanded awareness where the energy of love allows emotional reactions to certain pieces of music.” This notion appears throughout the book, encouraging readers to draw on the heart to clear the mind’s “chatter” and embrace the world rather than simply relying on hearing, seeing, tasting, etc. Perhaps Sanderson’s greatest strength here is taking topics that might feel difficult for some readers to grasp—such as expanded awareness—and making them feel comfortable, accessible, intriguing, and engaging. The book will likely speak to those ready to take leaps of faith in their own odysseys to the unknown, tapping into new senses and experiences that question their past perceptions and limitations. If nothing else, readers should be inspired by the author’s bravery and candor in revealing the riveting details of her journey. A strong autobiography recounts one woman’s road to spiritual enlightenment. "The Reluctant Messenger by Psychologist Candice M. Sanderson is a Marvelous Example of Channeled, Transcendent Literature at its Best." That might be a good adage to describe the experience of CANDICE M. SANDERSON, a pragmatic, hard-working, by-the-book psychologist who was minding her own business one day when transcendence suddenly came knocking, unbidden and out of the blue. No one could have been more shocked than her. Readers of THE RELUCTANT MESSENGER will travel along with Sanderson on a remarkable journey that unfolds like the proverbial lotus flower. These first downloads of information are interesting enough, but perhaps not so unlike much of New Age pronouncements already out there. (There’s no shortage of books today based on channeled information, not to mention perhaps thousands of YouTube videos. In fact, this is a phenomenon literally centuries old). But as Sanderson grows into her practice and becomes ever more accepting of the remarkable experiences, she learns to tune in her “frequency” with greater skill. What she brings out thereafter just gets more amazing page after page. I’ve read dozens if not hundreds of books written by channelers. For me, what makes Candice Sanderson’s book different is twofold. … and more. Don’t worry, I’m not giving too much away because, believe me, you’re going to want to hear what all of the above have to say. All of these powerful sources aren’t trotting across the stage of Sanderson’s mind merely to spew vague philosophies — they’re throwing down some real cosmogonic red meat you’ll all be chewing on for a long time to come. Ken Korczak is a top reviewer for Amazon. He is a former newspaper reporter, government information officer, served as an advocate for homeless people as a VISTA Volunteer, and taught journalism at the University of North Dakota for five years. He is the author of Bird Brain Genius. "Understanding human consciousness more deeply is a common quest, yet it is not uncommon for books to present the topic in terms too complex for readers to grasp. This book is different as the topic is explained in clear and comprehensible terms. 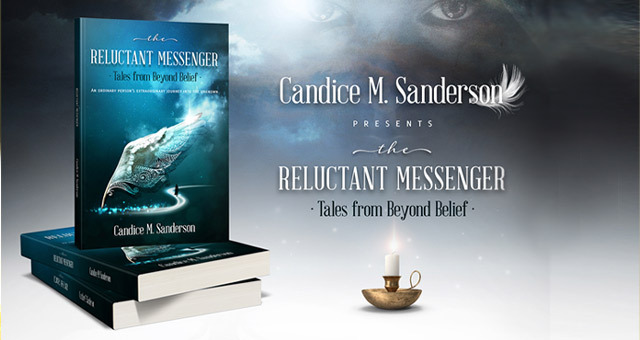 Author Candice M. Sanderson shares her spiritual awakening journey in the uplifting book, The Reluctant Messenger - Tales from Beyond Belief: An ordinary person’s extraordinary journey into the unknown. Working as a school psychologist, the author shares how her seemingly ordinary life transforms into one of amazing synchronicities and life lessons. The messages that she receives from The Muses Within are both universal and personal; she learns to see the significance of many events within her own life. A thorough explanation of energy and vibration, as well as messages pertaining to Candice’s family, are shared. From interacting with angels at her husband’s death to information about her little granddaughters, these personal experiences add to the genuineness of her story. The authentic voice within this book is its greatest quality. Candice writes in an easy to read flowing style, often starting her writing with a cup of coffee in hand or pulling out her cellphone to record a new message from The Muses. Although the imparted information is vitally important, the reader learns it is also accessible to all people. And, it may be imparted in unexpected ways. The Reluctant Messenger by Candice M. Sanderson provides exceptional insights into the oneness of all. It truly is a gem and will benefit all spiritual seekers." "The Reluctant Messenger by Candice M. Sanderson, treated as a trustworthy contributor to the massive influx of spiritual guidance offered by transcendent sources, is most noteworthy for both its precision and its incisiveness, as well as its inclusiveness. Most seasoned spiritual seekers in this time of rapid “download” and energetic transformation are at least tangentially familiar with the basic topics Ms. Sanderson addresses. That this author is the active recipient of much non-verbal knowledge and somewhat esoteric information (at first, a rather unwilling participant, to say the least,) speaks to the extremely difficult task she then assumes of presenting a great deal of complex information clearly to the public while also making it highly accessible to the lay reader. She fulfills her task perfectly. Reminiscent of the massive coverage given to these subjects by Dolores Cannon, The Reluctant Messenger mirrors some of the same information whereby Candice M. Sanderson derives and lends further credibility, such as: the effect of energy frequency and vibration on personal transformation, the nature of consciousness in all living and material forms, the relevance of angels and other higher beings in a perceptible global transformation, the prophetic qualities of ancestral wisdom traditions and teachings, not to mention the purely personal transformative guidance consequent to ego-surrender, compassion, and sincere prayer. Told with down-to-earth clarity and candid revelation, even when Ms. Sanderson expects a reception of ridicule (e.g. for those fairies and elementals referenced by her transcendent tutors,) her book makes a great primer for anyone wanting to explore deeper issues of spiritual guidance and transformation." 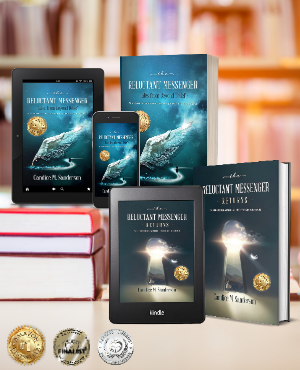 "The Reluctant Messenger: Tales from Beyond Belief: An Ordinary Person’s Extraordinary Journey Into The Unknown by Candice M. Sanderson is a fascinating book about the epic, life-changing journey of the author while being a conduit for spiritual messages. This book reveals the story of incredible tales from beyond belief that invite us to consider that we are actually more spiritual than physical. Apart from unfolding her own personal journey, the book shares the messages received by Candice, copied straight from her journals and transcribed from her recordings. The cosmic patterns, communicating with spirits, and the awareness that true life is timeless and formless will make you wonder about what exists beyond this universe. The book is a must-read for readers who are curious to learn more about spirituality, awakening, and enlightenment. The author’s perception about human consciousness and spiritual understanding are both profound and insightful and will give readers a different spiritual journey. The author’s experiences are proof of the indelible link that exists between the two worlds. The book gives hope to readers about how dreams can open doors to these magical realms filled with boundless ideas which will help to bring positive change for all humanity, and sometimes the valuable lessons that can be learned through these dreams can be enriching. I found the book enlightening and I thought it makes a good read for all those who are planning to embark on a spiritual journey. The author’s words and experiences will make readers reflect, contemplate, and introspect as they seek for answers to their questions and ponder about the spiritual dimensions that exist." Click here for Book Notes and Free Excerpt.